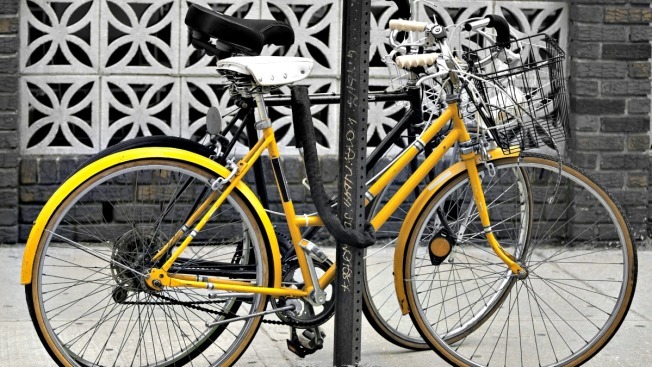 D.C. is a great city for bicyclists -- and for bicycle thieves. Read on for our tips for keeping your bike (and yourself) safe. The cost of a sturdy lock will always be a better deal than the cost of replacing your bike. However, it's not always easy to know which brand will work for you. Jeffrey Holliday, operations manager at Bike and Roll D.C., recommends using a U-lock device from either the Kryptonite or Onguard brands. These range in price widely and are usually graded on a numerical scale according to the thickness of their steel. The higher the number, the higher the price. Holliday recommends something in the 6 to 8 range for peace of mind, but points out that even the best locks can be broken. Holliday said that using a U-lock device is safest if you also invest in a chain to lock around the wheels. Locks will deter criminals, but they might not stop them. The more roadblocks you can put in a potential thief’s way, the more likely they'll give up or fail in their attempt at swiping your property. There are other options to consider too. Ixow makes the Stemlock, which disables the handlebars of the bike until they're unlocked with a key. If you like a little technology with your security, you could invest in a Bluetooth bike lock such as the Skylock, which can only be unlocked via an app on your phone. Although you'll want to balance technology with resistance to brute force, this product can even alert loved ones if you get into an accident. No matter which lock, or locks, you decide to purchase, you'll want to maximize their efficiency. If your bike has quick-release wheels, pop off the front wheel and lock it separately to the frame. You can also purchase devices to lock the saddle to the frame. But follow these tips from Bicycling Magazine to really give thieves a hard time. Holliday said that a sturdy lock can be broken into with an angle grinder -- and it does happen. He said that his team sometimes have to cut a lock open if someone has lost the key, and people will not always question them. Thieves can be brazen and fast, and although you shouldn't approach a suspicious person if you feel unsafe, analyze the situation and keep a description in mind, in case you need to call police. Affix something distinctive (and permanent) to the frame -- especially if the bicycle is otherwise nondescript -- such as writing your initials in permanent marker, which Bicycling Magazine suggests. Register your bike with the city; although it's no longer a legal requirement, it might help you get it back one day. Keep a document that has all the key features of your bicycle, including its serial number, and snap a quick photo of the bicycle and any identifying features. If you fall victim to theft, WABA say it is important to file a police report; it might help with insurance claims, too. Next, you may want to check Craigslist, eBay and any sites that may be hawking your property. And post your notice on local blogs asking if anyone has seen your property. Popville is an especially active community. You may also want to check the police department's photo gallery of recovered stolen property, just in case. If you do see someone riding your bike in public, though, as tempting as it is, you shouldn’t immediately assume they are the culprit -- it’s best to notify the police instead of intervening. It doesn’t matter which device you use if you don’t use it in the right place, said Greg Billing, advocacy coordinator of the Washington Area Bicyclist Association (WABA). Billings said that when you're looking for something to lock your bike to, seek something sturdy that’s firmly planted in the ground, or fences that are sturdier than chain link and that cannot be quickly cut with bolt cutters. However, chaining a bicycle to trees, signposts and bus stops can be illegal, so first look for designated bicycle parking. Holliday said the inverted U-shaped bike stands are the best of those found outdoors. Local businesses can also ask the city to install a bicycle rack for free, by calling the Mayor's Citywide Call Center at (202) 727-1000. WMATA offers some secure options, if you live or work close to the right stop. The best is the secure Bike & Ride facility at the College Park station. Metro also offers bicycle lockers, which are secure, single-use boxes to store your bike and equipment. Rental costs $120 per year. See a list of stations with bike lockers here. Union Station is home to the only Bikestation, which has a facility with secure bicycle parking, changing rooms and free air for the tires. Membership costs about $12 a month. The most important parts to keep an eye on are tire pressure, the chain (which will need to be kept clean and lubricated) and the brake pads. You can check out guides online, such as this one, to give you some pointers. If keeping track of your bicycle's health is a little confusing, head to a free maintenance clinic with The Bike House, a bicycle repair co-op in Petworth. The sessions are split into four-week classes that begin on the first weekend of the month, and teach beginners the essential skills to oversee the upkeep of their bikes. Attendance is limited, so check their site for information. Annie's Ace Hardware in Petworth hosts a clinic from noon to 4 p.m. on Saturdays, March through November. Bloomingdale Farmer’s Market hosts a clinic from 11 a.m. to 1 p.m. on Sundays, May through November. Cycling can be a fantastic alternative to trains and buses for commuters, or simply a fun way to explore the city during the summer. But it does come with the dangers of navigating busy roads with congested traffic. You already know that a good helmet is essential riding gear, but it's also important to know how to stay out of harm's way in the first place. WABA offers courses on safe city riding to help you gain confidence, and can even teach adults to ride (there's no shame in never having learned). Keep up to date with laws and responsibilities for cyclists in D.C. here. If you are involved in an accident, check WABA's advice on what to do immediately after a crash. Insurance premiums can be expensive, especially if your bike wasn't -- but it's worth checking your existing policies to see if they do cover bicycle theft. Many renters' insurance policies do. This is especially important if you do have an expensive bicycle. You'll want to make sure that the deductible covers an appropriate amount. Billing said that although no one product has yet emerged as the must-have bicycle safety tool, there’s a lot on the horizon. Keep an eye on sites like Kickstarter for new and innovative products that might keep you and your bicycle safer. Some inventions that might become commonplace include tracking devices small enough to hide under the saddle, blinkers for the handlebars and even GPS devices and noisy anti-theft alarms embedded into the bicycle's frame, Billings said. Closer to home, WMATA plans to build two more Bike & Ride facilities at Vienna and East Falls Church stations next year, which will be accessible using a registered SmartTrip card. Nothing can guarantee you complete safety in the city, but there's a lot that you can do to keep yourself and your cyclist friends safer.